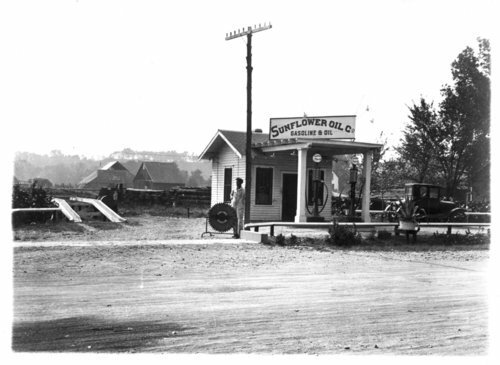 This photograph shows a man standing outside the Sunflower Oil Company service station located at the southeast corner of the intersection of Main and Newbury Streets in Paxico, Kansas. The station operator is Clem Muckenthaler. In the background on the left, is the Chicago, Rock Island and Pacific Railroad right-of-way, slightly elevated.